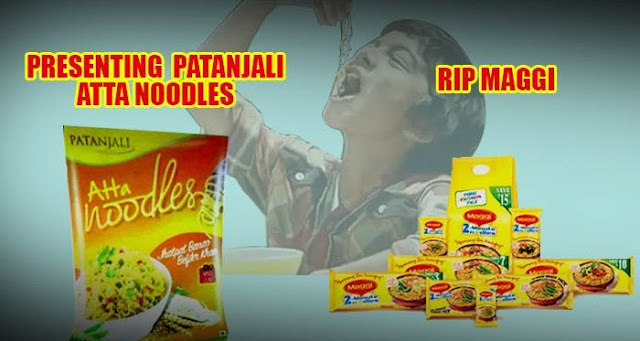 Baba Ramdev's Patanjali Ayurveda will launch its instant noodles next week at a price of Rs 15, a move seen as an attempt to capture the market lost by Maggi -- the market leader till a few months back that had to go off the shelves following regulatory orders. Phrasing the catchline for the noodles as "Jhat pat pakao, aur befikr khao", the yoga guru claimed it will have 'no added MSG and lead'. These findings were later challenged by the company before the Bombay High Court, which quashed those orders and ordered fresh tests. Nestle is looking to relaunch the product by December.Maggi noodles, which were being sold by Swiss giant Nestle with a catchline of 'two-minute' noodles had to be taken off the shelves after food regulator FSSAI found excess lead and taste enhancer MSG despite 'No MSG' labelling. "We will launch Patanjali noodles on 15 October. It will be made from whole wheat flour (atta), not like noodles of other companies which are made up of maida and has only 10 per cent atta," Ramdev said at a press conference here. "Our noodles will be available at Rs 15, whereas other used to sell it for Rs 25 and its taste-maker will be a health maker," he added. He further said, "Patanjali noodles will use rice-bran oil and not cheap and inferior palm oil as used by others." "We are working on the principles of swadesshi, where we work for the betterment and health of the country," he said. Ramdev also said that he has no issues with the functioning of FSSAI and is open to any scrutiny of his products.